This page is a guide to Lloret de Mar’s best bars, nightclubs, pubs and shows. Lloret de Mar nightlife – what to do and where to go at night in the Costa Brava’s major party destination of Lloret de Mar. Where are the best bars in Lloret de Mar? What are the best nightclubs in Lloret de Mar as well as venues and acts? What is there to do at night in Lloret de Mar? Where are the best pubs in Lloret de Mar? Where is the best place to meet women/men/girls in Lloret de Mar? How much do drinks cost in pubs, clubs and bars in Lloret de Mar? This video shows what fun Lloret is! Lloret de Mar is a busy and very popular seaside beach resort located on the Southern Costa Brava just seventy kilometres away from Barcelona. The El Prat airport near Barcelona connects directly with Lloret de Mar by train and there are also daily bus services available to Tossa de Mar, Figueres, Barcelona, Girona and Montserrat. Getting to Lloret de Mar is relatively straightforward. Fly into Girona airport which is nearest or alternatively try Barcelona airport. For prices and options see our transfers to Lloret page. Lloret de Mar has seven kilometres of coastline with five main beaches making it the place to be during the day and at night there is the Lloret de Mar nightlife to enjoy. 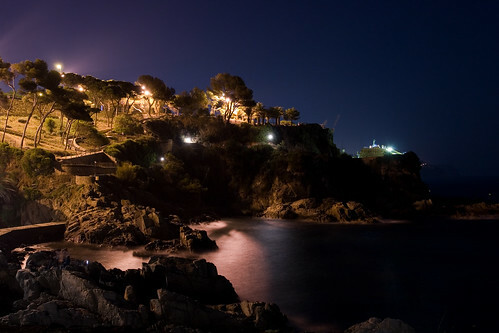 Lloret de Mar is without a doubt the nightlife capital of the Costa Brava. Popular discos in Lloret de Mar include the St Trop’ Disco, Revolution, Disco Salero, Disco Londoner where admission is €12 includes two free drinks, Nidara S.I., Constur S.I., Tropics with two floors and five bars, Bumper’s Disco, Hollywood Dance Club where admission is €12 to €15, Moby’s, Privet de Magic for the young members of the public, Gerry’s Bar fro sixties and seventies music, La Siesta for the flamenco nights. There is also the Queen Vic, Zodiac, Dream Café, Zoo, Disco Moefga-Ga, Magic, Colossus, Texas, Happy Day, Aztec, Techtonik, Hard Rock Yates and Rockefellers. These venues can be open all day, some open in the afternoon while others only really get going around midnight and will close its doors just as the sun rises. Lloret de Mar really is a tourist resort that never sleeps. Those people that like to gamble can visit the Casino Lloret de Mar which is situated on the road to the coastal resort of Blanes. For adults there is the Russian club Gala Lloret de Mar where there are male and female dancers performing. One can also try the Beach Party experience which takes place on a boat cruising the coastline. As is the case with most nightclubs in Spain the clubs open their doors just before midnight and close when the last clubbers leave. Lloret de Mar nightlife costs around €12 admission and includes at least one free drink. Dress code is casual. Lloret de Mar nightlife is about bar hopping, karaoke, flamenco, dancing and having a good time, nothing too sophisticated! Lloret de Mat at night. The resort is popular for spring breaks, hen and Lloret de Mar stag dos, and the three most popular hotels to stay in Lloret de Mar are the Aquarium Hotel Lloret de Mar, Guitart Central Park Resort & Spa and the Hotel Samba Lloret de Mar. If you have found this Lloret de Mar nightlife page because you are looking for bars for sale in Lloret de Mar or you want to buy a bar in Lloret de Mar, then we suggest going instead to our business section which has a useful page on buying a bar in Spain. If you are interested in coming to Lloret de Mar looking for work then read our jobs in Spain page which has a good section on finding bar jobs in Spain. Me and my friends are going to visit costa brava during the last week of August. Can you please suggest us any parties/ big events that we should not miss?